Italy officially kicks off the winter tyre season with mandatory winter tyres – or snow chains – on the A5 Aosta-Turin, south of the Mont Blanc Tunnel. The first mandatory winter wheel rules, on the Italian side of the Mont Blanc Tunnel. 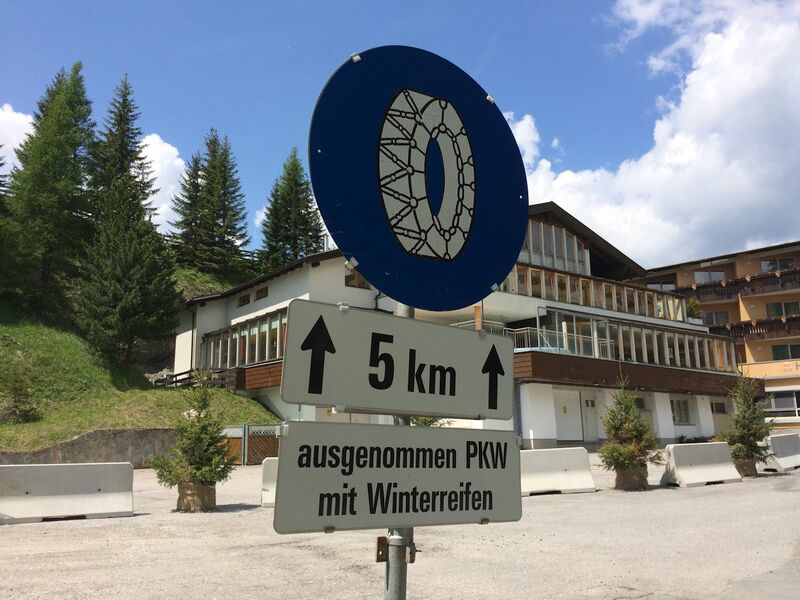 Austria: snow chains 5km ahead ‘Ausgenommen PKW mit Winterreiffen – except light vehicle with winter tyres’. Photo @DriveEurope. German drivers were advised at the start of the month to swap to winter tyres, in line with the phrase ‘Oktober bis Ostern’ (October to Easter). It turned out to be good advice as this week saw first snow across the country, on high ground from west to east. Like most Continental European countries – including Luxembourg, Austria and most of Scandinavia – cars in Germany need so-called ‘winter tyres’ (see below) – in ice, slippery frost or snow. The only country where drivers have to fit winter tyres in the winter months, whatever the conditions, is Finland. Meanwhile, today – Thursday 15 October – marks the first day in Italy when drivers have to adapt to potentially wintery conditions. On the A5 south of the Mont Blanc Tunnel, drivers without winter tyres must carry a set of snow chains. Other at risk roads have the same requirement from when the Italian winter officially starts on 15 November but roads in and around mountainous areas may require winter tyres/chains from 1 November. Many high passes in the Dolomites require chains at any time of the year. See the official map from the Transport Ministry with the latest information. While there are no winter tyre rules in France they can be an alternative to chains on mountain roads in snow, depending on whether road side signs include ‘pneus neige admis’ (snow tyres allowed). Similarly in Switzerland, there is no law on winter tyres but ‘not adapting a car to the conditions’ will attract the attention of local police. So-called ‘Winter Tyres’ – there is no agreed standard for a winter tyre. The commonly used snowflake symbol has no legal force. The only legal markings are M+S (mud and snow). Since these also feature on All-Weather tyres, it could make sense for drivers who don’t want to buy – and store – two sets of tyres to invest in these instead. Our All-Season tyres saw fuel consumption drop compared to the previous summer set but it improved, and then some, as the weather turned warmer again. However they have yet to be tested on snow. See more. Also see more on Winter Tyre Rules Around Europe.